Note: Click on picture for Full View! Survival – These are biological needs such as food, water, shelter, sleep. 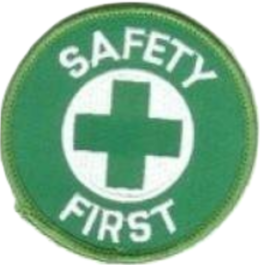 Safety – This need requires stability, security, order, law, and protection from elements. Self-Actualization – This is the need that requires people to fulfill their potential and what they believe they’re capable of. Survival – We know this is a basic need. This includes the need to have a job, a salary that pays the bills, and a sense of financial independence. Safety – When we have jobs, we need to know that they are secure. With the way the job market is nowadays, it’s hard for many to move past this second most basic need. It also causes individuals to need structure in the workplace, with a chain of command and a process for their duties so they feel confident that they’re doing their job correctly. Belonging – People need to feel like they’re part of a team, that they are a part of something bigger. As employees, humans need to know their individual contributions are valued by the company. If your organizational is setup around team principles, then this sense of belonging and “camaraderie” should come almost naturally. Importance – This need dovetails into the “belonging” need in the sense that individuals need to feel like they’re important to a team, projects, and the overall organization. 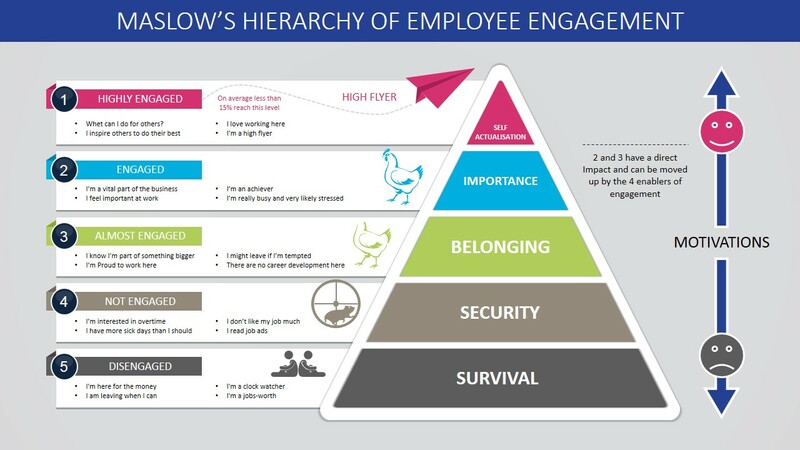 This need is most prevalent inside of larger companies where the need to engage employees on a personal level becomes harder and harder for higher level management. Self-Actualization – Most employees have some level of ambition and want to achieve more than where they’re currently positioned. Giving them opportunities for growth, learning, leadership and advancement gives them all of the tools they need to begin to self-actualize within your company’s walls. When they reach this point, and are taking full advantage of the tools made available to them, they inspire others along the way and create a ripple effect of employee engagement. These needs are critical for the fulfillment of a satisfying professional life and career, so how can you provide this type of environment for your employees? The first two needs are fairly simplistic – pay your employees a livable wage and don’t make them feel as if their job is on the line all the time. Have a strong organizational structure that promotes teamwork and inclusion and you can begin to fill the third need. The fourth need, importance, is where things like employee recognition come into play so strongly. When your employees perform well, let them know it. Recognize them publicly for their accomplishments and reward them for what they’ve done. The public recognition lets the employee know their performance is important and that it matters. Incentive programs also work well here because they give employees tangible rewards for their performance. When someone receives a reward, or is able to use something like reward points to redeem for the reward item of their choice, they emotionally connect that reward to their jobs and feel important and accomplished because of it. Self-actualization is realized because when employees feel important and recognized, they feel like they can take on more ownership of their role, and more of a leadership role within their company. This kind of employee is incredibly beneficial to the health of employee engagement because their enthusiasm and attitude actually inspire others to want to perform on their level. It’s contagious, and it works with workplace safety too!